American film maker Michael Moore has a long history of supporting the cause of labour, and some of his support has been to Canadian unions such as during the Vale strike in Sudbury. That strike is, of course, now history, but Vale has "rewarded" the workers at its plant in Thompson Manitoba for not going out on a wildcat solidarity strike by...closing down their operations in Thompson thereby throwing 100s out of work and essentially gutting the economy of the town. As Moore says in his blog posting this "economic development" is being financed at least in part by "economic development" grants from the federal Conservative government. Some development ! 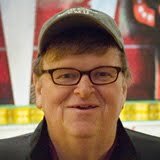 Here's Moore's well written and entertaining blog posting on this subject. It's nice to see that this province occasionally gets at least a little notice. Please be aware that I do not share Moore's enthusiasm for the NDP, though I guess in the context of American politics even a right leaning social democratic party like the NDP looks good. To people down here in the U.S., Thompson, Canada and its fight with the Brazilian mining giant Vale may seem very far away. Canada isn't like the United States -- it's still a first world country, where corporations are supposed to exist to benefit people, not the other way around. They don't just have universal health care -- they even have something called the Investment Canada Act, which says multinationals like Vale can only invest in Canadian industries if it will benefit all of Canada. I know, crazy! The mine in Thompson used to be run by Inco, a Canadian corporation that made peace with unions and shared the wealth. When Vale bought Inco in 2006, they signed a contract with the government setting out what they would do to benefit Canadians. Immediately afterward, Vale violated the contract and went on the attack -- forcing miners in Sudbury, Ontario out on the longest strike in their history. And now in Thompson they're trying to shut down the smelting and refining operations that have made the city a major economic hub of the province. Meanwhile, the Conservative government of Stephen Harper -- think of George W. Bush with a Canadian accent -- is actually helping Vale do this to their fellow citizens, with a giant $1 billion government loan which Vale is using to move jobs out of Thompson. Moreover, the largest institutional investor in Vale is Blackrock, an investment firm which in turn is owned by several of America's bailed-out banks ... including Bank of America. So this is about one thing and one thing only: killing the social contract of Canada. Vale and the Harper government don't want a future where Brazil gradually becomes more like Canada. Instead, they want a future where Canada becomes Brazil. And not just Canada: the corporations' plan is that the Third World will become the Only World. That's why people everywhere need to support Thompson. As Niki Ashton -- the MP who represents Thompson and the second-youngest woman ever elected to the Canadian Parliament -- says: "It Was Flint Yesterday, It's Us and Wisconsin Today, and Tomorrow It's Going to Be Everyone." And that's why I'm proud to feature Ashton and voices of the people of Thompson on my website. And it's why I'm asking you to watch their powerful video, hear their stories, and share them with everyone you know. Regular people across the world are standing up right now and saying "No!" to the future they have planned for us. We won in Egypt. We're waking up and fighting back across the U.S. Let's all stand with Thompson and make it the place where we turn the tide in this awful war. As Kamal Abbas, one of Egypt's most important union leaders, said in a video message to Wisconsin: "We stand with you, as you stood with us." Labels: Canadian labour, conservatives, labour., layoffs, Manitoba, manitoba labour, Michael Moore, Thompson., Vale.